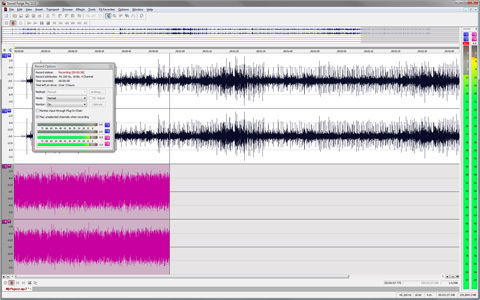 Sound Forge is an award-winning digital audio editor that has been around for over 10 years. Sound Forge audio editor contains a powerful set of processes, tools, and effects for the recording and manipulation of audio and is used by many professionals for recording and mastering, and producing streaming audio and CDs. Version Pro has Integrated disc-at-once CD burning. It also works with ACID allowing you to create ACID Loops, assign root notes, tempo, and number of beats. Feature highlights: automated time-based recording and audio threshold record triggering, VU/PPM meters for RMS playback and record monitoring, enhanced Spectrum Analysis tools, white, pink, and brown noise generators, clipped peak detection and marking, Media Explorer, Sound Forge project file creation, support for 24fps DV video files and much more. Sound Forge remains a standard for professional audio editing and mastering on the PC platform. Bugfix for Edit > Treat as Cutlist command unavailable. Fix for a bug that could cause Playlist names to be corrupted after undoing a change in the Regions List. Fix for a bug that could cause Playlist names to be corrupted after dragging a region from the Regions List to the Playlist. Fix for a bug that could cause regions in the Regions List to be deleted when pressing Delete to edit a region value. Fix for a bug that could cause duplicate markers or regions to be discarded when saving files. Fix for a bug that could cause multiple regions that use the same start time and name to be sorted incorrectly in the Regions List. Fix for a bug that could cause a crash when clicking the Play buttons in the Regions List window. Fix for a bug that could cause warnings to be displayed inconsistently when deleting regions that are in use by a Playlist/Cutlist. Fix for a bug that could clear Playlist, Track List, and Region List selections when right-clicking to display the shortcut menu. Fix for a bug that prevented you from adding a selected region to the Playlist/Cutlist unless the Regions List window was visible. Fix for a bug that caused the Track and Index items in the Track List window to appear to be editable. This has been a popular listing on SMM since Sound Forge 7.0. Posted by Yoel López Soriano on Sun, 02/03/2013 - 22:40. Este es uno de los más completos editores de sonido.